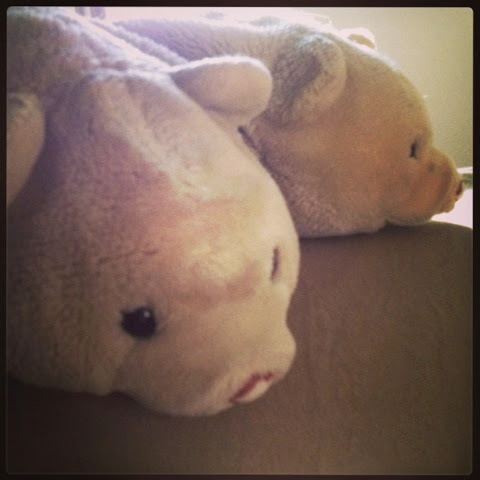 These are my Gund bears, or B's as I called them as a very young child. I got these before I was two and I still have and love them! They used to be white and the fuzz has scraped off their noses and their eyes are scratched and chipped, but they are very loved. I keep them with me--they stay in my dorm room to keep me company. They are some of the oldest things I own (that are mine, not handed down from my mother, grandmother, or great-grandmother). They are pretty special to me. My mom just bought a brand new Gund bear for my soon-to-be niece. It's all soft, white, and new. I hope she will love her "B" as much as I love mine!